AKYAPAK offers extensive alternatives on heavy duty profile bending machines as well. Our machines are strong and reliable with their St-52 weld construction body. Minimum flexion causes less deformation, by the help of our machines’ enlarged roll diameters. By the help of big measurements of bearings, durability and high bending momentum can be obtained. The power of hydraulic cylinders enables to bend the larger parts without difficulty. 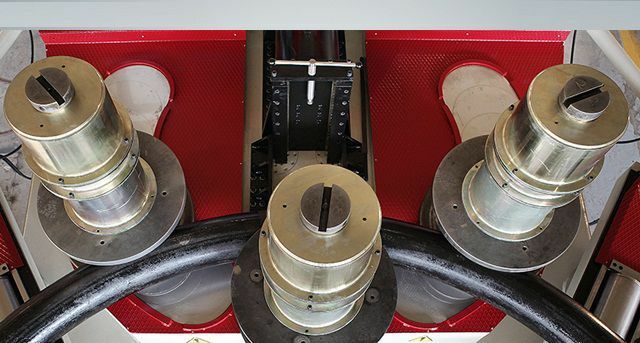 Practical and universal rollers creates the possibility of easiness for bending various sections, and this feature gives the opportunity of being more powerful and robust. Akyapak Profile Bending Machines are 3 rolls driven. This feature allows to have a possibility to make the high capacity bending processes real. Secondly, our 3 Rolls Driven machine minimizes the slipping of the materials during the bending process. The two bottom rolls are hydraulically driven and they can move independently with each other. 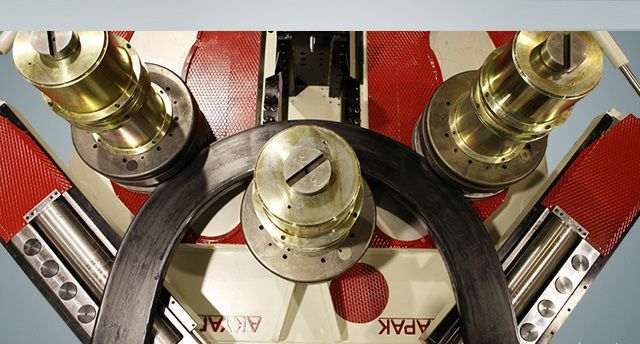 Therefore, in comparison with the machines which are top roll drive, the features of our machines enhance the ability of operators and give the opportunity to make prebending process on both edges. Side supporters can move towards three directions to reduce the deformations and to facilitate bending processes, especially with angles and spirals.